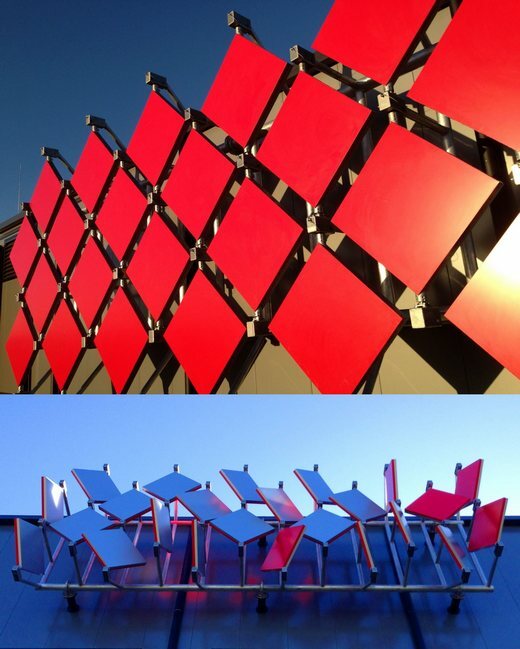 Readwrite is a cosmic-ray activated robotic artwork by Geoffrey Drake-Brockman, located in Perth, Australia. Readwrite is installed on the NEXTDC Data Centre in Malaga, Perth, Western Australia. It is 10m long and features a grid of 24 pneumatically-actuated 1.4m wide diamond-shaped flipping elements. Dance sequences on Readwrite are triggered by charged "Muon" particles. Muons are terrestrial Cosmic Rays generated in the upper atmosphere by interactions with high-energy particles from distant supernovae and black holes in active galactic nuclei. Readwrite has four Muon detectors, mounted at its corners. When a Cosmic Ray hits a detector, a wave motion sequence begins from that point. Other choreographed behaviours occur depending on the frequency and spatial distribution of the Muon flux. Readwrite only reacts to the rarest incoming Muons - those that are travelling parallel to the Earth's surface. Readwrite was installed in January 2014 and has been in near-constant motion since. It may be the largest terrestrial automata activated by stimuli of extra-galactic origin. The Readwrite control algorithm is a modified version of the code from Geoffrey Drake-Brockman's earlier work Floribots, and thus retains elements of the emotional modes of that work (bored, excited, etc.) - which were originally modelled on the behaviour of the Artist's sons at toddler age.